Juventus stunned the world of football this summer by signing the current FIFA Ballon d’Or winner Cristiano Ronaldo for €100 million from the European Champions Real Madrid. The Italian giants have historically struggled to reign in Europe, despite being the dominant side in Serie A, and will be hoping their new arrival can end a 23-year wait for the Champions League trophy. The Portuguese international, now 33-years-old, scored the decisive penalty as Real Madrid saw off the Turin giants in an epic 4-3 aggregate quarter-final victory in the Champions League back in April. In the first-leg, Ronaldo was given a standing ovation from the Old Lady’s supporters, after scoring a stunning overhead kick. The Bianconeri had also lost 4-1 to Real Madrid in the 2017 Champions League final in Cardiff, with Ronaldo bagging two goals. Although back in 2015, they overcame the Spanish giants in the semi-final, only to lose 3-1 to Barcelona in the final. Juventus have just won their seventh consecutive Serie A title to take their overall tally to 34, almost as many as both of the Milan clubs combined. Both AC Milan and Inter Milan currently sit on 18 titles each, yet have 10 Champions League titles between them. Milan currently lead the way in Italy having amassed seven (second only to Real Madrid’s haul of 13), whilst Inter reached the summit of European football for their third and last time with José Mourinho back in 2010. The Old Lady, meanwhile, have only won the Champions League twice in their history. Once in 1985, amidst the Heysel disaster, when they defeated Liverpool 1-0 thanks to a Michel Platini penalty, even though Zbigniew Boniek was fouled outside of the penalty area. Their second success arrived in 1996, as they edged out Ajax via a penalty shootout. It’s a competition which has never been kind to the dominant team of Italian football. No team has lost the European Cup/Champions League final more times than Juventus, who have failed on seven occasions at the final hurdle. If Ronaldo can lift the famous trophy with Juventus, he will become just the second player to have won the title with three different clubs, following Clarence Seedorf who achieved the feat with Ajax (1995), Real Madrid (1998) and AC Milan (2003 / 2007). 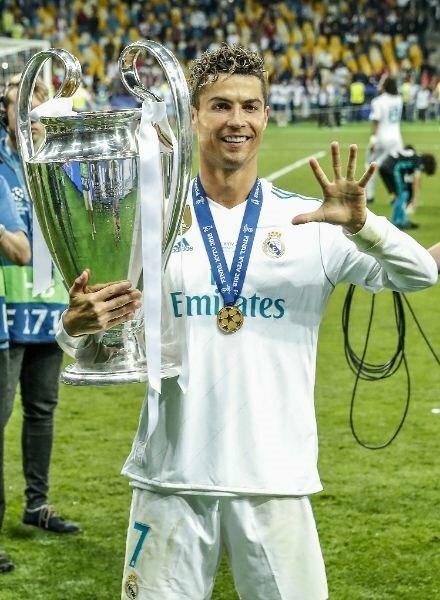 In addition, Juventus’ new number seven is just one Champions League success away from equalling Paco Gento’s record of six, which he won between 1956 and 1966, all with Real Madrid. The five-time FIFA Ballon d’Or winner, tied with Lionel Messi for the all-time record, was well received by the Juventus faithful on his arrival in Italy. A reported 520,000 Cristiano Ronaldo shirts were sold within the first 24 hours of their availability, helping the Turin club to recoup some of their €100 million transfer fee. The former Manchester United forward affirmed his desire to leave his mark on the history of Bianconeri, declaring that he hasn’t gone to Italy ‘for a holiday.’ If he is to leave his mark at Juventus, he will need to inspire them to lift the biggest prize in club football.